Using high quality Galvanized wire or pvc coated steel wire with latest technology, we fabricate premium Barbed Wire. 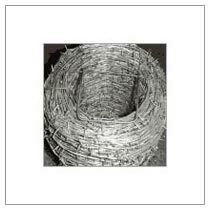 We are a reputed Manufacturer and Supplier of durable Barbed Wire that is used for fencing at boundaries of home and farms. We also cater to customized orders according to buyer’s requirements. Our testing team makes sure that Barbed Wire is corrosion resistant and has longer service life. We are trusted by our clients for timely delivery and affordable prices. Military or Prison Fence Etc.